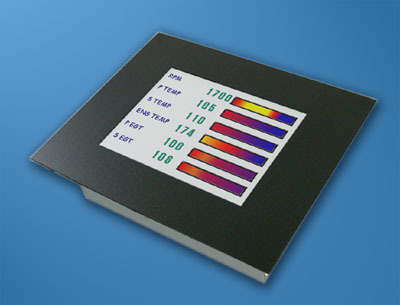 When connected to vGauge-Remote sensor unit, up to 16 color digital gauge readings are possible. There is a 16' max cable length with USB and 150' max cable length with RS232 (serial) interface. 4" diagonal sunlight readable color LCD is bright and easy to view. QVGA 320X240 pixel display format can fit up to 12 gauges on a single page. Available with USB 2.0 or RS232 serial connections to vGauge-Remote sensor unit or PC/Laptop. User defined gauge displays. Pick from 10 graphic options with customized labels and text sizes using vDash Virtual Instrument Design software. Load up to 8 different display pages for real-time use. Flush mount in dash or console. 12 user modifiable sensor calibration tables. 256 data lookup points per sensor input. 4 character display lookup for each of 256 data points. NMEA 0183 $IIXDR sentences - one for each of the 16 sensors. Continuous transmission once per second. Unit continuously samples all sensor inputs and performs a multi-point average. Averaged data is formatted into a NMEA $IIXDR sentence and output once per second. 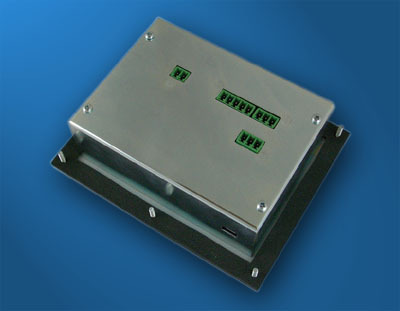 Rugged aluminum enclosure measures 5" X 4.5" X 1.55"